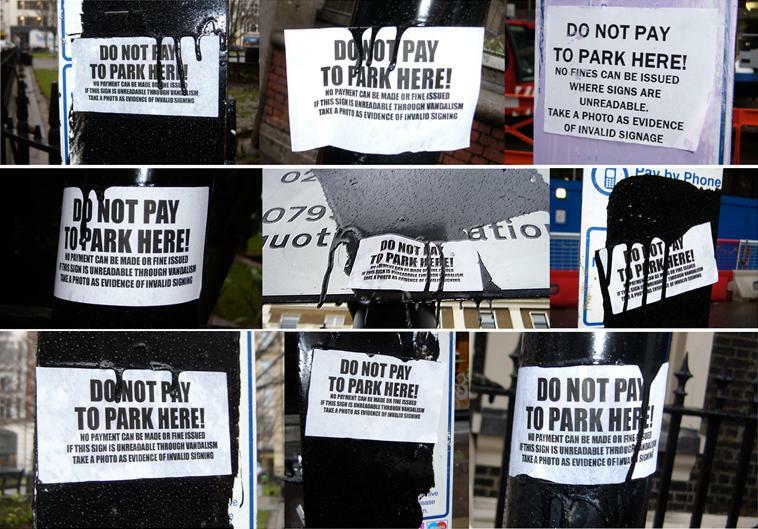 “DO NOT PAY TO PARK HERE! No fines can be issued where signs are unreadable. Take a photo as evidence of invalid signage”. These are the new instructions we have today found displayed in Westminster’s motorcycle parking bays. So, this time, not only have the signs been defaced with thick black paint, but written instructions advising bikers not to pay for their parking were also displayed, which is a brand new development that we haven’t seen before. We have been advised that a large number of bike parking signs were found defaced (again!) on Sunday morning, then repaired on Sunday afternoon by Westminster Council, to finally be all defaced again on Sunday evening. This is just hilarious! It appears that there is now an army of unknown citizens hanging around and constantly defacing all these motorcycle parking signs. We wonder how long Westminster Councillor Danny Chalkley is going to continue to hang around like a clown with his bike parking tax. According to the Evening Standard, he’s already wasted more than £60,000 worth of taxpayers’ money to replace and repair vandalised parking signs and keep the shareholders and employees of his pay-by-phone parking supplier, Verrus, happy and wealthy. More than £60,000 of public money spent so far on keeping his ridiculous and hated motorcycle parking tax scheme going, thus increasing the Council’s enormous budget overspend of £22 million, as recently reported by the BBC. Despite the thousands of objections Chalkley received to his motorcycle parking tax and the thousands of bikers who have been protesting in the streets of Westminster and bringing Central London to a standstill at many occasions, he has totally ignored them all and made his scheme “permanent” with effect from today. Well, although UK France Bikers.com does not support any form of illegal protest, we must confess that we find all this vandalism very entertaining indeed. While defacing the bike parking signs may well be one of the most effective ways to eradicate this unwanted stealth tax, it is very sad to realise that bikers have no other option available to make their voice heard than vandalise the street furniture and undertake legal proceedings against Westminster City Council for suspected breach of procurement contracts in the implementation of the Verrus pay by phone parking technology. I wonder how many people are involved in defacing the signs. There must be lots considering how many signs are done in one day! I don’t think WCC were expecting so much reaction and attention. They delibarately tried to introduce their bike tax quietly, but look now, many papers talk about it. Scrap the tax – I’ve had enough to see my money wasted by a load of incompetent Tory councillors. bikers and scooterers will not tolerate this anti bike tax any longer, if democracy is broken in Westminster council what other choice is there ?